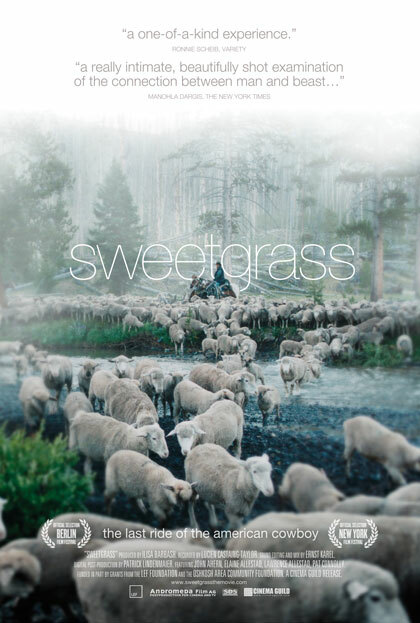 “Is Sweetgrass even a movie about sheep? Not in the sense that March of the Penguins is about penguins. There’s hardly a frame in Sweetgrass without a specimen of Ovis aries bleating, grazing, or even gazing into the camera, yet the educational and didactic rhetoric that typically characterizes entries in the “animal documentary” genre is noticeably absent. Diverging from the cutesy aesthetics that made Luc Jacquet’s penguin exposé an accessible, international hit, filmmakers Ilisa Barbash and Lucien Castaing-Taylor taken a far more empirical approach. There is no voice-over narration or “talking head” commentary, and until the very end of the movie there are no explanatory intertitles, either. Instead, they have crafted an ambient narrative in the cinéma vérité tradition that demands patient observation from the audience, but also rewards their attentiveness.